Call us at 919-828-2223 for an estimate. Auto Recon Pros, Inc. provides expert wheel repair, reconditioning and sales. We can fix bent, cracked, corroded, blemished and curb rashed rims. Our kwick drying silver paint can restore the finish and protect your rim guarding against further corrosion. A rim guarded by our quick silver paint refinishing / drying coating will maintain its luster. Call us at 919-828-2223 for an estimate. Alloy wheel repair on a bent rim can be performed the same day in most cases. If you need a quick turn-a-round or emergency alloy crack repair we will do our best to provide you with our expedited bent wheel corrected service. Our ACU-TRU® certified wheel repair specialist can restore your wheel to a fully functioning and serviceable condition. We are a Licensed ACU-TRU® rim and wheel facility and receive ongoing instructions and training in wheel restoration. Wheels and rims are bent every day whether it be a pothole, curb or accident. Uncorrected vibrations will not only destroy your tires, it can cause serious damage to both the steering and suspension systems of your vehicle. As an ACU-TRU® Dealer, we can repair your bent wheels on the same day depending on the severity of damage. We provide guaranteed alloy wheel repair services to individuals and businesses alike. Steel wheels can also be repaired but replacement is usually a better choice. In either case, an we can service customers with exceptional wheel repair services. The ACU-TRU® Rim & Wheel Refinishing System for OEM wheel or aftermarket wheels allow us to match the gloss, texture, and tint. We are proficient in the following systems: Self etching primers, industrial acrylics, powder coating, and hyper finishes. As an ACU-TRU® Dealer, we provide exceptional wheel refinishing services for OEM stock and custom wheels. Our work is done in-house at Auto Recon Pros, Inc. after the evaluation of your wheels. Your finish is color matched using manufacturer paint codes for all domestic and foreign automobiles while utilizing high quality factory paint. Our services are guaranteed, see your Auto Recon Pros, Inc. representative for more information on wheel and rim refinishing services. We have the cure for your leaking bead seats. If your tires are leaking air it is likely that you have a bent wheel or that your rim bead seats are corroded. Our bead seat repair service is guaranteed to seal your used wheels for two years. We grind the corrosion and apply two coats of a self-etching primer followed by three coats of 100% type 316L Stainless Steel paint that will help to prevent any corrosion from reoccurring. 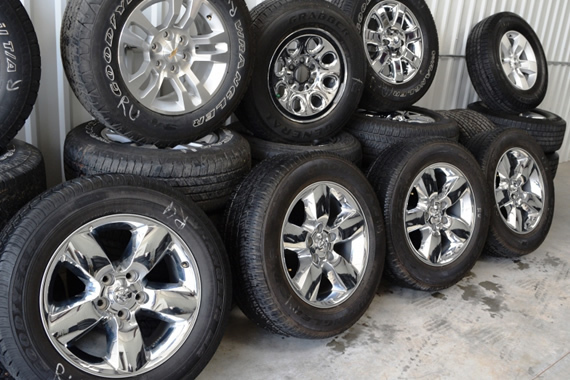 Give us a call today to learn more about our bead seat repair service for your used rims. The average bead seat repair costs approximately $155 per wheel and can be completed with same-day service. Computer numerical control (CNC) has been incorporated into a variety of new technologies and machinery. One such machine of this sort that is used for a wide array of production processes is known as a CNC lathe. A lathe machine is a machine tool which is used to remove metals from a workpiece to give a desired shape and size. In other words it is a machine that is used to hold the workpiece to perform various metal removing operations such as turning, grooving, chamfering, knurling, facing, forming etc with the help of tools. Repairing cracked wheels can be a difficult and extremely important element of an alloy wheel repair. The issues with cracked used wheels range from slowly leaking air for a small crack up to potential blow outs for large cracks. With time and added stress any crack can wide and spread to the point where the car, truck or motorcycle rim is no longer safe to drive on. Proper cracked used rims welding is a time consuming and delicate process. Do not use quick fix solutions such as sealing compounds, the problem is more serious than that. We consider a steel or aluminum alloy magnesium rim wheel to be non-repairable if cracks appear near the base of your spoke, near the lug area or on the inner lip of the wheel away from the spokes. However if the crack is small enough it is typically salvageable with a proper rim repair. Auto Recon Pros is a full-service auto body repair facility in the Raleigh, NC 27604 area, specializing in Towing and Auto Body / Paint / Refinishing Services since 2004. Our experts have the knowledge to repair even the most challenging collision damage on all makes and models of domestic and import vehicles. We use the latest technology to assess the situation and offer you alternatives. We guarantee all of our work and know you'll be happy with the outcome. Stop in or give us a call at 919-828-2223 to let us know how we can help you! We have over 10,000 factory original OEM wheels and rims in stock. Our inventory is full of steel and alloy rims for most years starting at 1995. If you need a replacement wheel, we are your one stop source for all of the major OEM brands such as Ford, Audi, Acura, Chevrolet, GMC, Hyundai, Volvo and more. Any wheel we don't have in stock we will be able to source by utilizing our extended dealer network that gives us access to over 30,000 wheels and rims. If you need a rare OEM wheel give us a call, we can find it.